I love black nails and I love white nails, so when I saw todays 31DC2013 theme combined the two, I was all over that! I got out my striping tape and got to work. Let's just say it was trail and error with this mani... My first attempt wasn't succesfull and neither was the second. But third time's the charm I hear, so I didn't give up! The end result was a fun and playfull mani, nowhere near perfect, my lines are wobbly and all over the place, but I'm actually really enjoying it! For my Liquid Leather review, click here. Boyfriend is an off white cream polish from the 2012 Spiderman collection. This polish has an ok formula. It can be a little patchy, but it usually does level out in about 2 coats. It dries fast and shiny and I love using this as a base for a lot of manicures. I can't really pull off white nails with my fair skintone, but Boyfriend looks ok on me. 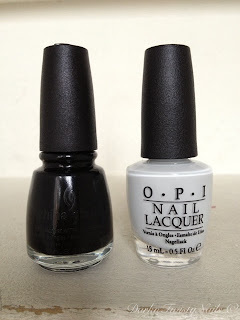 Adding the black to my mani was a great idea, it makes the white look less chalky and hard. 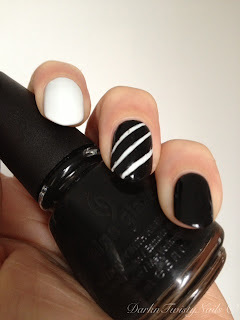 I absolutely love this on my nails and I will definitely do more B&W mani's! 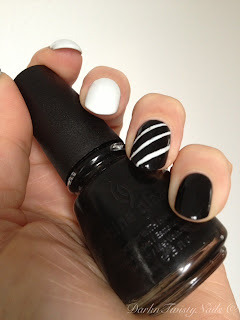 Do you rock the black and white on your nails? Great job Anca...I love black and white manis!